Up to 6,000 words. I am looking for essays dealing with matters of culture, race, and a sense of place, either within the smaller microcosm of self-identity or within the larger environment of family, society and world interactions. I seek essays in the traditional form, my definition being the conscious shaping of nonfiction prose around a central idea or subject. In E. B. White’s words, you will be putting your “finger on a little capsule of truth,” using reality to point to your truth, not fiction. 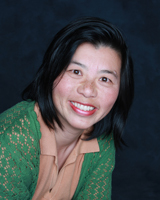 Li Miao Lovett (San Francisco, CA) is a writer, educator, and communications director in the San Francisco Bay Area. Her debut novel, In the Lap of the Gods, is a tale of love and loss set in China amidst the rising waters of the Three Gorges dam. Her First Prize Intercultural essay from 2009 is included in The Chalk Circle anthology, edited by founding judge Tara Masih. Li has been a contributor to the San Francisco Chronicle, New America Media, National Radio Project’s Making Contact, KQED’s Future of You science column, and KQED Perspectives. In both fiction and nonfiction, Li’s work has won awards or finalist standing from Glimmer Train, Writer’s Digest, Stanford Magazine, A Room of Her Own Foundation, and the James Jones First Novel Fellowship. As a freelance journalist, she recently documented the health effects of pesticides on farm-working communities with a grant from the Fund for Investigative Journalism.